While scouting out for a short backpacking trip, Arroyo Seco came to mind. I've been keeping my eye on it, since Sophia was too young for backpacking when we left San Diego, but she is a seasoned backpacker now. However, the information online was pretty confusing as to how to reserve it. ...Granite Springs and Arroyo Seco Environmental camps are open by reservation. Both have chemical toilets, non-potable water, corrals and tent sites. Contact Reserve America at reserveamerica.com to make your reservation. When you go to Reserve America and try to reserve a site, it's hard to even find Arroyo Seco campsite on there. I had to scroll a zoomed in map and click on the campsite. At the time I was trying to reserve the site, it had an X or some symbol that didn't really explain what it was. Right now, it reads Walk Up Only, which is way better than it was a month or so ago. Arroyo Seco and Granite Springs are WALK UP ONLY at the time of this writing. 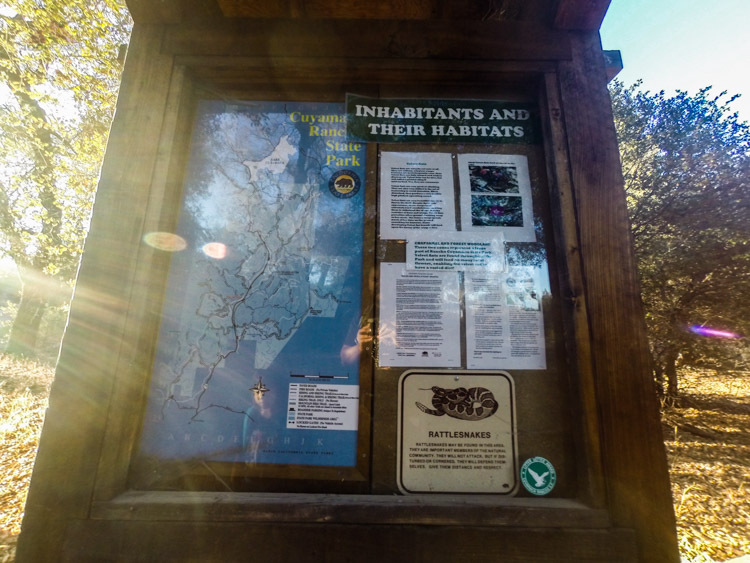 Call the Cuyamaca Rancho State Park ranger station, ask about the camp you want. They will likely give you the telephone number for one the kiosks at Green Valley or Paso Picacho. Call the kiosk and ask about availability. They are extremely helpful. They may recommend you call back on the day you are coming. For us, we got a really late start, so the Green Valley Kiosk was not manned when we arrived. We simply filled out one of their envelopes, stuffed some money in, and put it in the slot and parked up near the trailhead. Right away, we received confirmation of why Cuyamaca Rancho SP is one of my favorite places, as we saw turkeys roaming under the trees in the Green Valley day use area. It was a warm evening, but the sun was on its way down so we got started. We always chat while we hike. We noticed signs of the Cedar Fire and saw rabbits and birds all over. Sophia always keeps her eye out for interesting rocks and she found some here. It took us less than an hour to get to where we found campsite #1. Sophia, although a little tired, decided we should keep going. We encountered a sign that reads that the Arroyo Seco campsites are closed, which was obviously incorrect and outdated. We found campsites #2 and #3 further up the trail on the right. 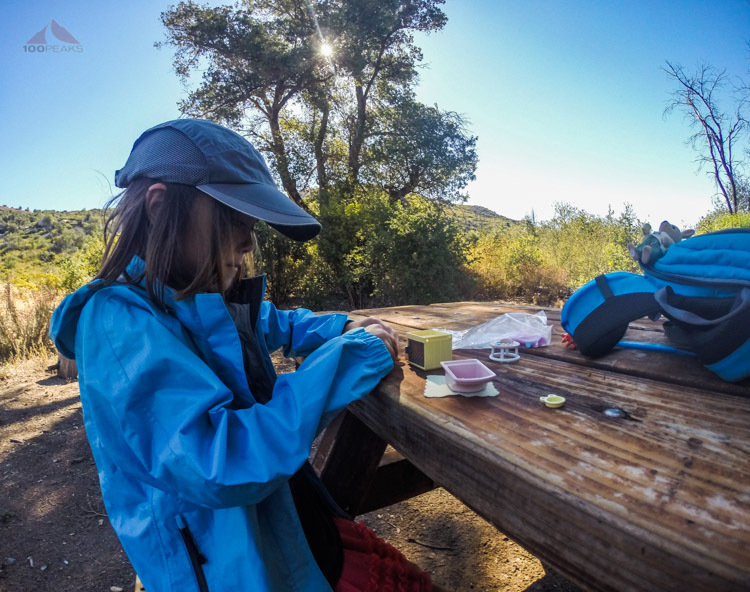 We hiked on a side trail to campsite #2 and decided that this picnic bench was too slanted, so we decided to continue deeper into the brush to Arroyo Seco campsite #3. It was perfect. There was a (level) picnic bench and room for two good-sized tents. In the fading light, we set up our tent and had our dinner on the picnic table. It had been a busy week and Sophia was ready for bed. She got into her PJs and her sleeping bag. "Dad, this so comfortable." Before long, she was asleep and so was I. It was nice to finally cool down after weeks of oppressive heat. We woke up when the sun hit the tent. The heat wave would continue shortly. We had some breakfast and packed up, wanted to leave before the mercury rose too high. As we passed campsite #2, Sophia pointed at the table and asked, "Dad, this table is in the shade, could we stop and play for a while?" I knew it would be getting hot, but she was asking to stay longer in the outdoors. I was happy that she felt completely comfortable outside and said yes. She brought out her toys and we role-played for a while. We stayed there for about 45 minutes, and saw some horseback riders come by. I looked at my watch, I told her it was time to go. She was OK with it and tried not to complain about the heat on the way back to the car. We saw some restrooms by the Arroyo Seco campground that we hadn't seen on the way up. It is on the east side of the trail past the corrals as you head toward campsites #2 and #3. They looked pretty clean and well maintained. I am happy that she is getting more experienced and is taking on, little by little, more responsibility for carrying items while backpacking. We are already planning our next one.